As the Mac’s administrator, you have the right to open, view, and modify programs, folders, and files on your drive at will. Other user accounts on your system are given varying privileges to read and change stuff. To regulate who gets to do what, the Mac has established a complex set of permissions. Open Disk Utility (in the Utilities folder inside the Applications folder), and click the First Aid tab. In the pane on the left, click to highlight the name of your disk, volume, or what’s called an image. Click Verify Disk Permissions to test permissions without changing anything (even if a permissions screw-up is ultimately revealed), or click Repair Disk Permission to test and set things straight. 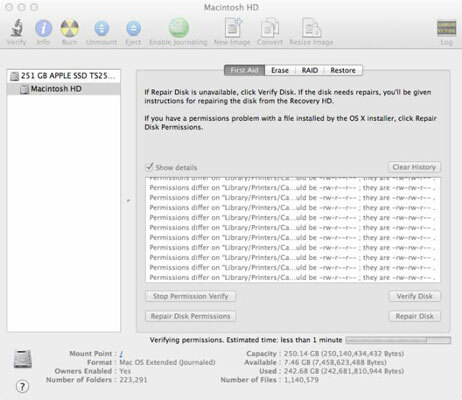 As Disk Utility goes about its business, a log of puzzling messages may show up in the results window. Don’t try to make heads or tails out of them, because they don’t necessarily indicate that your permissions were amiss. You can repair permissions only on the disk used to start OS X. After booting with this other disc, open Disk Utility, select your startup disk, and click Repair Disk. Incidentally, booting from the other disc is somewhat tricky. To do so, hold down the C key and wait until OS X boots. Make a language selection, and choose Disk Utility from the menu.